Alaska Youth Law Guide - Alaska Bar Association - Information about the mandatory Alaska Bar and the activities of the Alaska Bar Association. 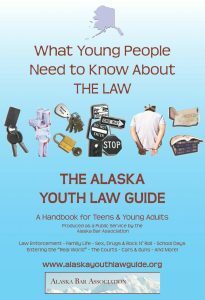 Welcome to the Alaska Youth Law Guide: A Handbook for Teens and Young Adults! This website is a public education resource presented by the Alaska Bar Association Law-Related Education Committee to help young Alaskans understand the law and how it may affect them. Here you will find general information about many of the legal issues teens and young adults are likely to encounter, and some resources for getting more information or assistance. We hope you find it helpful! This guide is not a substitute for having a lawyer. It does not provide specific legal advice and you cannot rely on the information presented here to solve a legal problem for you. Every legal problem is different, and there may be something about your situation that makes the general information presented here not applicable to you. There is no attorney-client relationship between you and the staff of the Alaska Bar Association or the Law-Related Education Committee. You are strongly encouraged to seek the services of an attorney for legal advice and strategy. The information presented here was accurate to the best of the Committee’s knowledge at the time it was posted. However, laws change frequently. Therefore, some of the information you read may be inaccurate or incomplete based on changes in the law since the Guide was written.